For a hull length of a trace over five metres and sporting a roomy cockpit, the Brooker 535R Cuddy has a big cuddy indeed. The reason is simple: no foredeck, no side decks; everything in front of the wheel is cabin. This is one of those boats that do the simple things well. With a hull weight of 490kg the Brooker is not a heavy boat, so the performance with a 100hp Honda was no surprise. 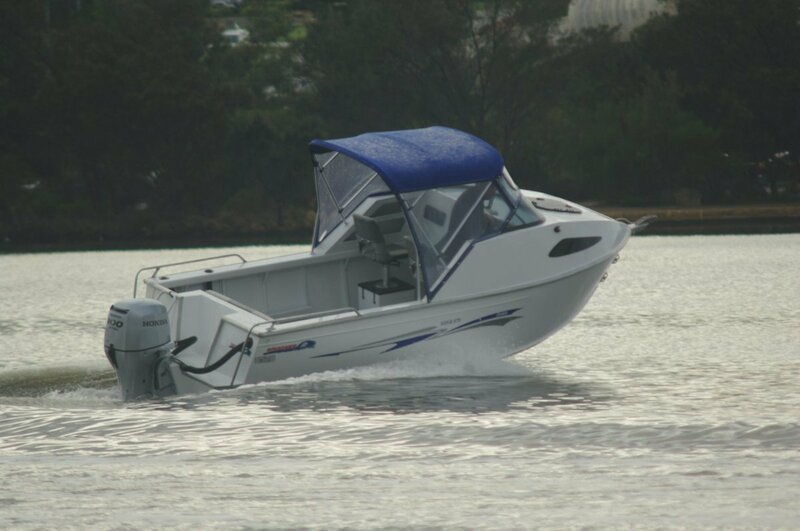 There was a time when 50hp on a boat of this size was considered close to over powering. Not that I hanker for those days - I like the concept of power in reserve. The power trim obeys your subtlest command; a full load of passengers (six is the official maximum) just calls for a touch more throttle. Give it its head and the Brooker gets up and boogies: there is some fun available here. Even more fun if you decided to go for the maximum 135hp Brooker recommends. Back to that cuddy. It has a huge volume that cries out for serious use – more than just using its good sitting headroom for temporary shelter. Previous customers have done just that, rigging it with sleeping bags for a pair of children and teaming this with camper backs linked with the Bimini over the cockpit. A pair of adults has room to get comfortable on air mattresses deployed over the carpeted deck. For serious camping work a barbecue can be installed at the transom. The absence of side and fore decks is not missed. Any rope or anchor work forward is easily handled through the clear fore hatch – which is how it is usually done anyway even on boats with abundant decks. Seating is better than basic. The two forward seats are comfortable swivels, pedestal mounted on locker boxes. These are reached via hinged lids rather than the more usual (and cheaper) cave openings. The steerage accommodation – but provided with a padded backrest - is on another locker box ahead of the transom. Where the 535 scores most conspicuously over other boats in its class is in coaming height. Many pressed ally boats of this size seem designed on the assumption that everybody sits all the time; certainly while fishing. These coamings are 700mm above the deck and contact standing legs at thigh height rather than near the knee. Options for fishing posture aside, this is reassuring with children aboard. Unlike individually finished plate boats, mass produced aluminium boats are mostly vulnerable when coming alongside. Masking the rubbing strake before painting costs time, so you get the weird state of affairs of the driver trying to protect his fenders from scratching. The local Brooker agent spent the extra dollars to give his customers raw aluminium to put against the jetty. In the past Hondas have generally been supplied with analogue gauges. These do a fine job of making a clear display of the vital signs. They do nothing for all the detailed stuff of fuel consumption, miles left in the tank and so on. Our boat had the optional extra of the latest digital display that can tell you things you never even thought of asking. Even a Luddite like me found it fascinating. There are plenty of other standard and optional features that take this boat out of the ruck: pod/boarding platform and ladder, two-level pockets alongside the seats, side windows in the cuddy, well fitting clears and more. Perhaps best of all is the top of the range Dunbier glide-on trailer. It persuades the 535 to do just that.